My husband and I wanted to adopt a dog and were setup with with this group. I was introduced to Emma a 7 month old little girl. Since I was not able to meet her, I had to have faith in the foster parents to provide me with information. That being said, Emma is a great addition to our family. She is sweet and truly loves her family. She celebrated her first Christmas this year and is learning what it means to be a spoiled beagle baby in our house. She and our older beagle, Riley, get along well and have really settled into being siblings. 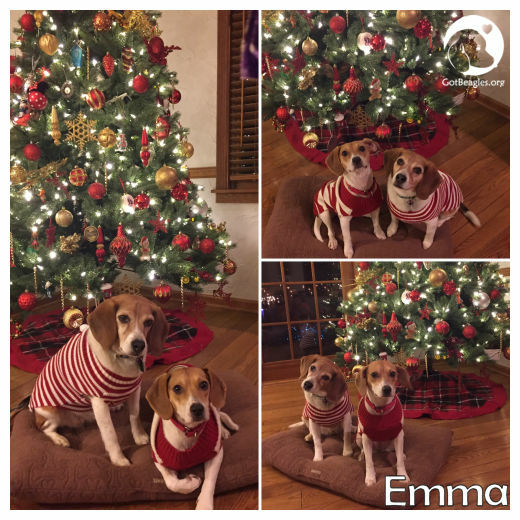 Attached is a picture of Riley and Emma during Christmas (Emma is in the thicker stripped sweater) and laying next to each other on the couch (Emma on the left).